About a year ago I saw a blog post somewhere about the Beekeeper’s quilt and was totally enamored with it. It looked like a crazy quilt, granny square hybrid that somehow managed to stay outside the realm of looking like the afghans that hang over the back of sofas in 70’s sitcoms. Not that I wouldn’t use one of those bad boys to wrap myself up burrito style–if I had one I would be in it now– but I thought if I made one I wanted it to be more modern. I think I bought the pattern the instant I saw it, but didn’t start it until a few months later. 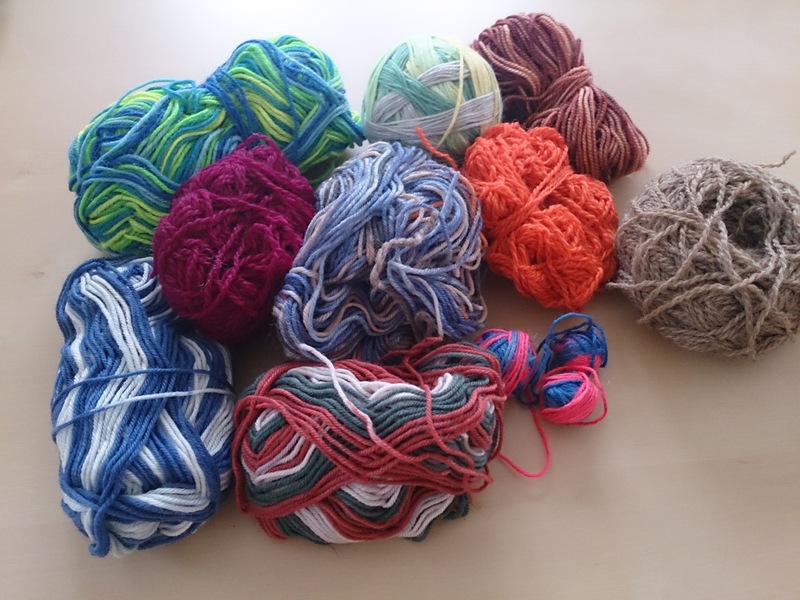 The thing about making a scrap yarn blanket it that you need scraps. I am pretty purposeful in my yarn purchases because I need to be budget conscious. I don’t really buy yarn (or anything for that matter) without some sort of plan. That’s not to say I haven’t bought the odd skein here or there but generally speaking I buy only enough yarn for what I need. Which made having extra yarn for this blanket sort of a predicament. 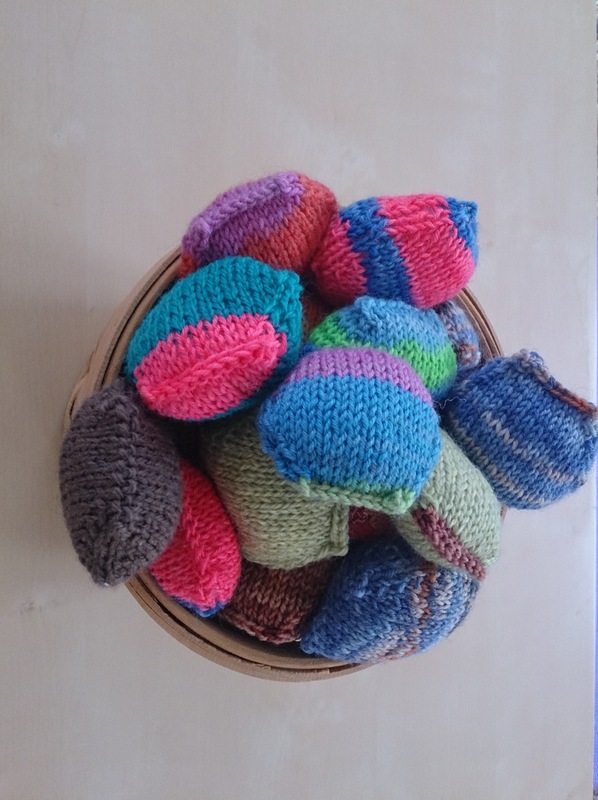 Then I knit a bunch of socks! For small footed humans. Sock yarn skeins typically have enough yardage for me to make knee socks for myself. Being a young teacher, I try to convince the kids in my classes that I am 1000 years old and knee socks wouldn’t really help my case. So no knee socks for me means lots of leftovers. 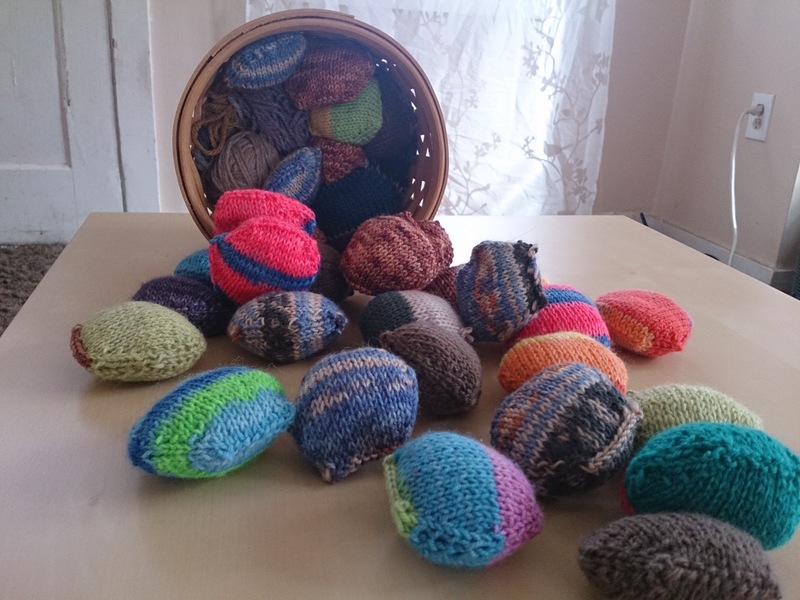 This is a hugely popular pattern that I’m sure many people are familiar with, but for those that aren’t, the idea is that you knit approximately a bajillion of these little poofs called “hexipuffs”, aptly named for their hexagon-y shape and puffiness, then sew them together. 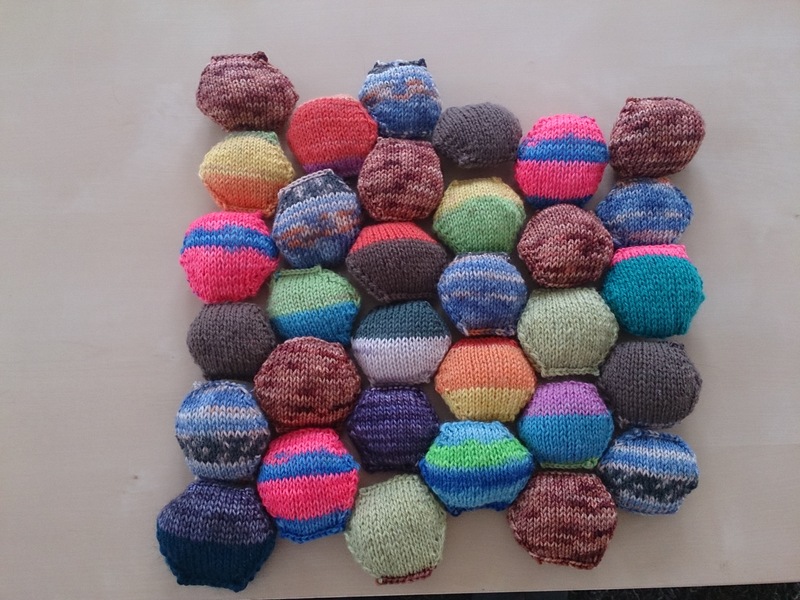 Each puff is started with twenty stitches, which increases to forty, then back down to twenty–this makes the hexagon. They are knit in the round, so until the last steps are reached they are like little pockets. After they’ve been decreased to the original stitch count they are stuffed with pillow stuffing, then bound off using a three needle bind off. They are entertaining to make for a few different reasons. Each one feels like a finished project in and of itself, so I feel hugely productive even if I’ve only been knitting for half an hour (which is about how long it takes me to make one). 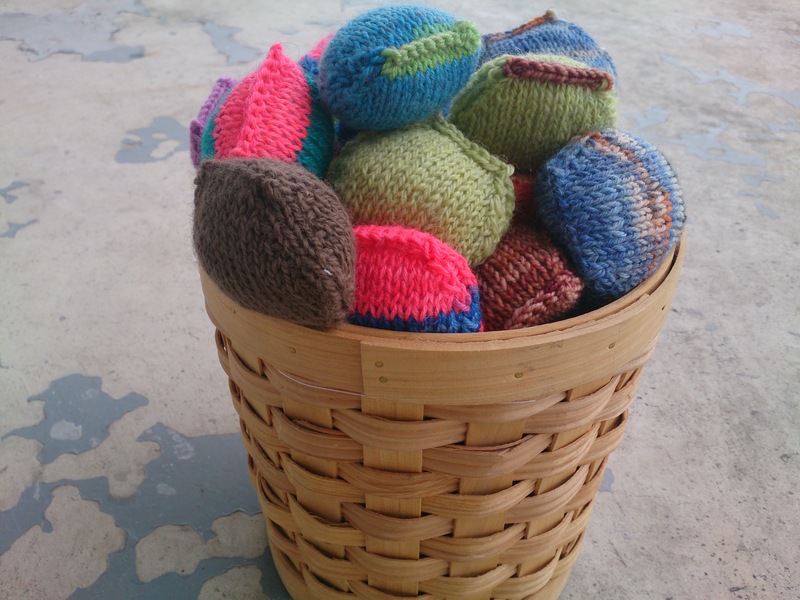 Each puff is a trip down a sort of knitting nostalgia memory lane. Whichever yarn I’m using reminds me of the socks I knit from it originally. There is yarn from socks for me, the kids I sit for, my man friend, my mom, my sisters, and odd scraps from other projects. It’s a nice way to remember both the project I made and the people I knit them for. They are also super squishy and fun to squeeze, so that’s good. I’m enjoying knitting this even though there isn’t an end in sight. It is most definitely a long-term project. I tend to pick it up every couple months and churn out half a dozen or so. At this rate I will probably be thirty five by the time it’s done but I’m just fine with that. Awesome I love the look of these little puffs!!!! Looks like it will be warm when you’re done!